Here you will find lists of my selected publications. My graduate research as a student at the University of Pennsylvania, working with the ATLAS experiment at the Large Hadron Collider at CERN, was on the reconstruction and identification of hadronic tau decays, measuring the SM Z→ττ production cross section in proton-proton collisions at √s = 7 TeV, and searching for new physics in high-mass ditau events. You can download my thesis here or find it at CDS as CERN-THESIS-2013-075. Machine Learning in High Energy Physics Community White Paper. arxiv:1807.02876, July 8, 2018. Search for photonic signatures of gauge-mediated supersymmetry in 13 TeV pp collisions with the ATLAS detector, Physical Review D, 97, 092006 (2018), arxiv:1802.03158, February 9, 2018. Search for supersymmetry in a final state containing two photons and missing transverse momentum in √s = 13 TeV pp collisions at the LHC using the ATLAS detector, European Physical Journal C, 76, 517 (2016), arxiv:1606.09150, June 29, 2016. Search for photonic signatures of gauge-mediated supersymmetry in 8 TeV pp collisions with the ATLAS detector, Physical Review D, 92, 072001 (2015), arxiv:1507.05493, July 20, 2015. A search for high-mass resonances decaying to τ+τ− in pp collisions at √s = 8 TeV with the ATLAS detector, Journal of High Energy Physics, 7, 157 (2015), arxiv:1502.07177, February 25, 2015, (served as editor). Identification and energy calibration of hadronically decaying tau leptons with the ATLAS experiment in pp collisions at √s = 8 TeV, European Physical Journal C, 75, 303 (2015), arxiv:1412.7086, December 22, 2014. A search for high-mass resonances decaying to τ+τ− in the ATLAS detector, Physics Letters B, 719, 242-260 (2013), arxiv:1210.6604, October 24, 2012, (served as editor). Measurement of the Z → ττ production cross section in proton-proton collisions at √s = 7 TeV with the ATLAS detector, Physical Review D, 84, 112006 (2011), arxiv:1108.2016, August 9, 2011. Performance of the ATLAS detector using first collision data, Journal of High Energy Physics, 9, 56 (2010), arxiv:1005.5254, May 28, 2010. The ATLAS Transition Radiation Tracker (TRT) proportional drift tube: design and performance, Journal of Instrumentation, 3, P02013 (2008), February 29, 2008. The ATLAS TRT Electronics, Journal of Instrumentation, 3, P06007 (2008), June 27, 2008. The ATLAS TRT Barrel Detector, Journal of Instrumentation, 3, P02014 (2008), February 29, 2008. The ATLAS TRT End-cap Detectors, Journal of Instrumentation, 3, P10003 (2008), October 21, 2008. ATLAS Collaboration, Combined search for the Standard Model Higgs boson in pp collisions at √s = 7 TeV with the ATLAS detector, Physical Review D, 86 032003 (2012), arXiv:1207.0319. ATLAS searches for heavy Higgs bosons and supersymmetry using tau decays, Nuclear and Particle Physics Proceedings 287-288 (2017) 195-198, June 21, 2017, (only author, proceedings for my talk at Tau2016: the 14th International Workshop on Tau Lepton Physics, in Beijing, China). A re-interpretation of electroweak supersymmetry production ATLAS analysis results using 20.3 fb−1 pp collisions at √s = 8 TeV to explore higgs-motivated general gauge mediated models, ATLAS-CONF-2016-033, July 11, 2016. Searches for charged Higgs bosons, supersymmetry, and exotica with tau leptons with the ATLAS and CMS detectors at the LHC, Nuclear Physics B (Proceedings Supplements) (2014) 171-175, ATL-PHYS-PROC-2012-302, December 1, 2014, (only author, proceedings for my talk at Tau2012: the 12th International Workshop on Tau Lepton Physics, in Nagoya, Japan). A search for high-mass ditau resonances decaying in the fully hadronic final state in pp collisions at √s = 8 TeV with the ATLAS detector, ATLAS-CONF-2013-066, July 18, 2013. Identification of the hadronic decays of tau leptons in 2012 data with the ATLAS detector, ATLAS-CONF-2013-064, July 18, 2013. 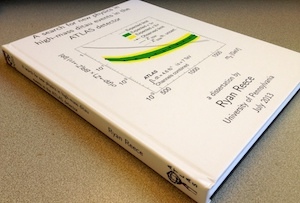 A search for high-mass resonances decaying to τ+τ− in the ATLAS detector, ATLAS-CONF-2012-067, June 30, 2012 (served as editor). Performance of the Reconstruction and Identification of Hadronic Tau Decays with ATLAS, ATLAS-CONF-2011-152, November 13, 2011. Measurement of the W and Z boson production cross sections in pp collisions at 7 TeV with the ATLAS detector, ATL-PHYS-PROC-2011-240, November 10, 2011 (only author, proceedings for my talk at the 2011 International Europhysics Conference on High Energy Physics (EPS) in Grenoble, France). Reconstruction, Energy Calibration, and Identification of Hadronically Decaying Tau Leptons, ATLAS-CONF-2011-077, March 24, 2011 (served as editor). Observation of Z → ττ → ℓτh Decays with the ATLAS detector, ATLAS-CONF-2011-010, February 23, 2011. Tau Reconstruction and Identification Performance in ATLAS, ATLAS-CONF-2010-086, October 11, 2010. Event Display of Z → ττ → μτh in 7 TeV Collisions, ATL-COM-PHYS-2010-775, September 23, 2010 (only author). Reconstruction of hadronic tau candidates in QCD events at ATLAS with 7 TeV proton-proton collisions, ATLAS-CONF-2010-059, July 10, 2010. You won’t have access to these unless you are a member of ATLAS. Search for strongly- and weakly-produced GMSB signatures in the diphoton and ETmiss final state in √s = 13 TeV pp collisions at LHC using the ATLAS detector. ATL-COM-PHYS-2016-1683, Draft: June 15, 2016 (Support note). A re-interpretation of electroweak supersymmetry production ATLAS analysis results using 20.3 fb−1 of pp collisions at √s = 8 TeV to explore higgs-motivated general gauge mediated models. ATL-COM-PHYS-2015-1438 Draft: June 24, 2016 (Support note for ATLAS-CONF-2016-033). Search for a diphoton and ETmiss final state in √s = 13 TeV pp collisions at LHC using the ATLAS detector. ATL-COM-PHYS-2015-1136, May 17, 2016 (Support note for 1606.09150). Search for a diphoton and ETmiss final state in √s = 8 TeV pp collisions at LHC using the ATLAS detector. ATL-COM-PHYS-2014-442, February 23, 2015 (Support note for arxiv:1507.05493). A search for high-mass resonances decaying to τ+τ− in pp collisions at √s = 8 TeV with the ATLAS detector. ATL-COM-PHYS-2014-276, January 23, 2015 (served as editor, Support note for arxiv:1502.07177). Recommendations of the physics objects and analysis harmonisation study groups 2014. ATL-COM-PHYS-2014-451, May 12, 2014. A search for high-mass ditau resonances decaying in the fully hadronic final state in pp collisions at √s = 8 TeV with the ATLAS detector. ATL-COM-PHYS-2013-125, Feb 4, 2013 (Support note for ATLAS-CONF-2013-066). Identification of the hadronic decays of tau leptons in 2012 data with the ATLAS detector. ATL-COM-PHYS-2013-155 Oct 11, 2013 (Support note for ATLAS-CONF-2013-064). A search for high-mass resonances decaying to τ+τ− in the ATLAS detector. ATL-COM-PHYS-2012-394, June 11, 2011 (Support note for ATLAS-CONF-2012-067, served as editor). TRT Straw Hit Efficiency. ATL-COM-INDET-2011-088, September 23, 2011 (only author). Measurement of Z → ττ production cross section in proton-proton collisions at √s = 7 TeV with the ATLAS detector – Support Note for lep-had channels. ATL-COM-PHYS-2011-416, April 21, 2011 (Support note for arxiv:1108.2016). Measurement of Z → ττ production cross section in proton-proton collisions at √s = 7 TeV with the ATLAS detector - Combination of results. ATL-COM-PHYS-2011-419, April 21, 2011 (Support note for arxiv:1108.2016). Reconstruction, Energy Calibration, and Identification of Hadronic Tau Decays for Winter 2011. ATL-PHYS-INT-2011-068, March 2, 2011 (Support note for ATLAS-CONF-2011-077, served as editor). Observation of Z → ττ → ℓτh Decays with the ATLAS detector – Support Note. ATL-COM-PHYS-2010-1033, December 10, 2010 (Support note for ATLAS-CONF-2011-010). Tau identification performance with the ATLAS detector. ATL-COM-PHYS-2010-599, August 2, 2010 (Support note for ATLAS-CONF-2010-086). Commissioning of the ATLAS Tau-Lepton Reconstruction Using 7 TeV data. ATL-COM-PHYS-2010-392, June 18, 2010 (Support note for ATLAS-CONF-2010-059). Benchmark Analysis for Z → ττ → ℓτh with the First 100 pb−1. ATL-PHYS-INT-2010-075, February 25, 2010 (served as editor). A Selection Strategy for Z → ττ → μτh with the First 100 pb−1 from ATLAS. ATL-PHYS-INT-2009-044, May 5, 2009 (only author). TRT Low Threshold Calibration. ATL-INDET-INT-2008-002, July 16, 2008 (only author).